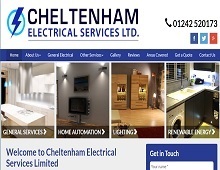 Cheltenham Electrical Services Ltd are a qualified electrician in Cheltenham, for years they have been specialising in electrical installations, operating across both Gloucestershire and Worcestershire. They are members of the NICEIC Approved Contractor Scheme and on the Electric Safety Register, so customers can be reassured that they are using a contractor that complies with the latest electrical and safety regulations. Cheltenham Electrical Services Ltd are also your local emergency electricians in Gloucester, they operate a 24/7 emergency call out service for areas in both Gloucestershire and Worcestershire. Looking for an experienced electrical contractor in the Cheltenham area? Give the electricians at Cheltenham Electrical Services a call today!